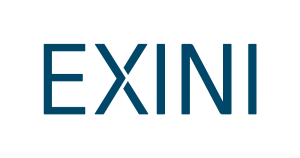 The automated Bone Scan Index (aBSI) technology, developed by EXINI Diagnostics AB, gives a fully quantitative assessment of bone scans that incorporates inferred masses of all lesions. The computed index reflects the proportion of the total skeleton mass that is observed to have tumor involvement1. In a prospectively defined multi-institutional phase 3 study with 721 metastatic prostate cancer patients, aBSI was found to be an independent prognostic determinant of overall survival and the study supported using aBSI in the design and eligibility for clinical trials for systemic therapies for metastatic castration-resistant prostate cancer2. As of 2017, aBSI is provided as a secure and compliant web application readily available from a web browser by logging in to, www.bonescanindex.com. In Europe, the device is CE-marked according to MDD 93/42 EEC, and is available for clinical use in Austria, Denmark, France, Germany, Ireland, Netherlands, Sweden, Switzerland, UK. In the United States, aBSI is available for investigational use only. Ulmert D, et al. A novel automated platform for quantifying the extent of skeletal tumour involvement in prostate cancer patients using the Bone Scan Index. Eur Urol. 2012. Armstrong AJ et al. Phase 3 Assessment of the Automated Bone Scan Index as a Prognostic Imaging Biomarker of Overall Survival in Men With Metastatic Castration-Resistant Prostate Cancer: A Secondary Analysis of a Randomized Clinical Trial. JAMA Oncol. 2018. BONENAVI, the platform to calculate bone scan index in Japan, was launched 2011 with partner FUJIFILM RI Pharma. The platform is developed and validated for Japanese patient population. Since its launch in 2011, nearly 900 hospitals have incorporated BONENAVI in their regular clinical workflow. 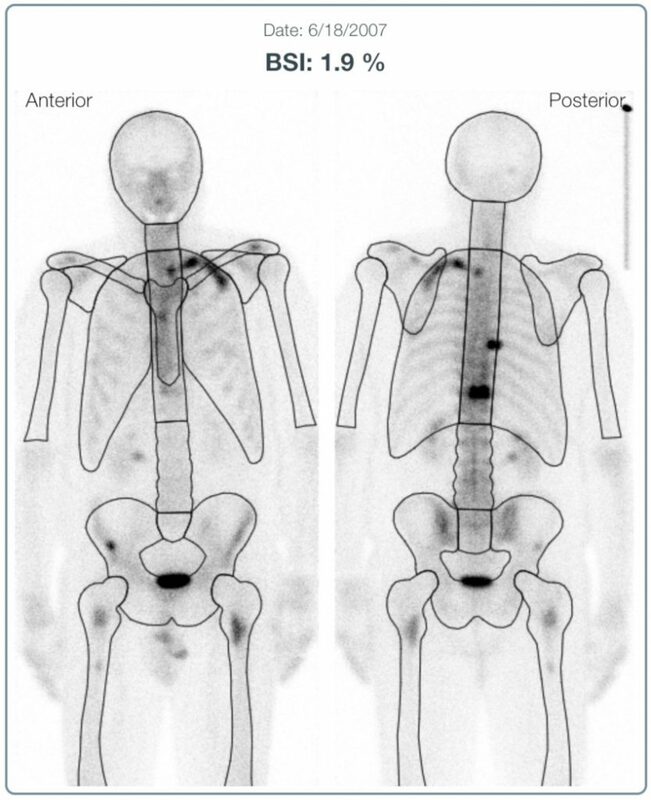 Illustrative BONENAVI reports are used in discussing treatment evaluation with patients. 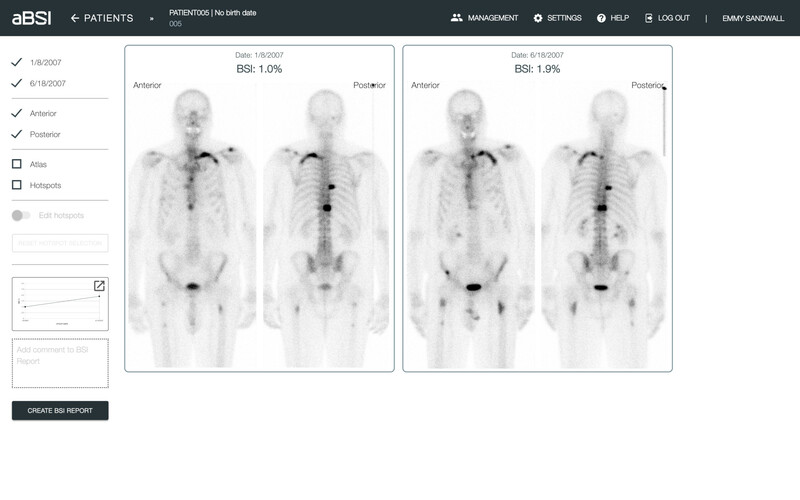 The society of nuclear medicine in Japan recommends bone scan index for use in metastatic prostate cancer to assess metastatic burden in bone. The availability of BONENAVI has generated clinical value of the bone scan in prostate cancer. FUJIFILM currently holds the exclusive rights of BONENAVI in Japan. The display module has a user friendly interface and includes a standardization and normalization of whole body bone scans. A model of the skeleton divided into 31 regions is automatically and accurately fitted to each scan. The model is displayed for quality control. 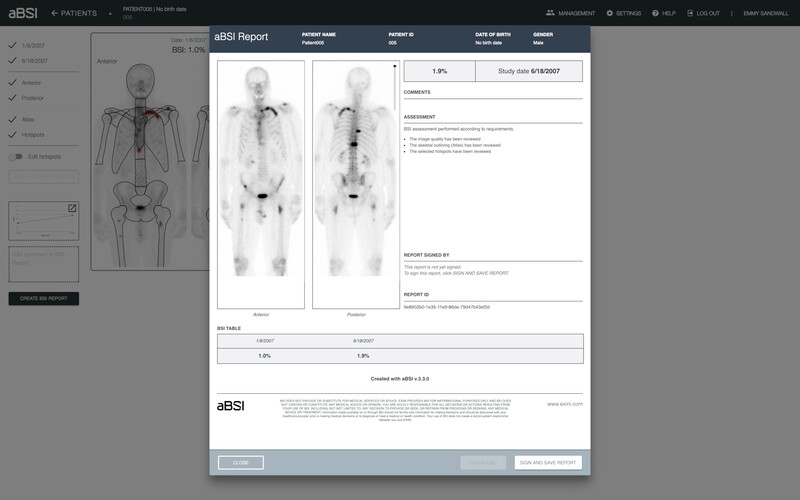 aBSI automatically calculates the BSI values that reflects the extent of skeletal involvement by tumor in whole body bone scans based on the pre-selected hotspots. 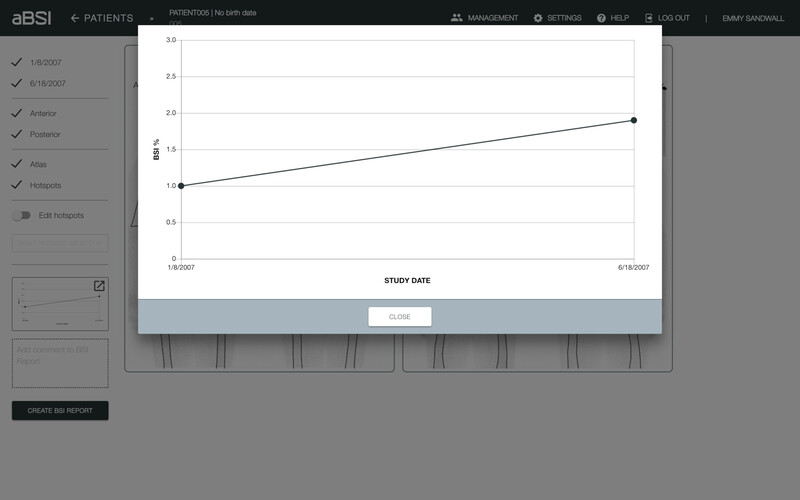 aBSI generates a trend curve to make it easier to compare BSI values between studies. The BSI Report will by default include the bone scans of the latest study together with patient information, any written comments and information about the reporter. A list of BSI values for up to 8 studies is also included. If you already have an account, you can use it to log in to aBSI from your computer. Our technology, included in our product aBSI and BONENAVI, is well documented in several studies. Here you can find the most frequently asked questions and contact information to our customer support.